We are having our hunger strike asking congress to pass the DREAM Act Now! en español, para todos los padres que hicieron el sacrificio para todos nosotros. On Monday Dream Act youth and allies staged a peaceful sit it at Senator Hutchison’s San Antonio office asking the decade old question of “What will it take?” On the Senator’s watch, sixteen of these courageous youth and community members were arrested. 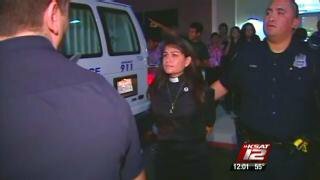 This included Pastor Lorenza Andrade Smith who has decided to stay in jail until the DREAM Act gets a vote in the Senate. Pastor Smith is a leader of C.O.P.S/ Metro Alliance. 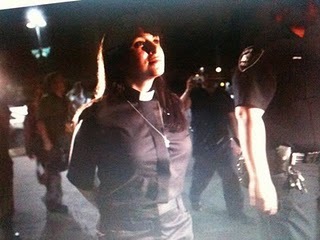 She is a clergywoman for the Rio Grande Conference for the United Methodist Church and has been fasting since Thanksgiving. The alliance meets with the mayor, councilmen and Senators to discuss community issues and they have discussed immigration concerns such as the DREAM Act. Two days later, the Houston community followed the escalation at the Mickey Leland Federal Building as a new version of the DREAM Act came out. Even though the changes in the new version are exactly what Senator Hutchison indicated she wanted, the Senator locked the doors on Houston’s DREAM Act youth and supporters. It seems business as usual at Suite 800 was not so usual in the middle of the workweek. Today, the action continues in Austin where a rally is scheduled outside Senator Hutchison’s office. In all this, we expect to get a more positive answer from the Senator as we are sure she knows the stakes. We certainly are not able to continue doing the supposed “right” actions like countless of lobby visits and at the end of the day being locked out. Senator Hutchison, we want you to stand with us and as you know, the eyes of Texas are upon you. true American values plus help the economy. Dream Students STUDY-IN Dirksen Senate Cafeteria! DREAM ACT VOTE THIS SATURDAY!!!!!!! SAN ANTONIO ESCALATES SUPPORT FOR DREAMERZ!